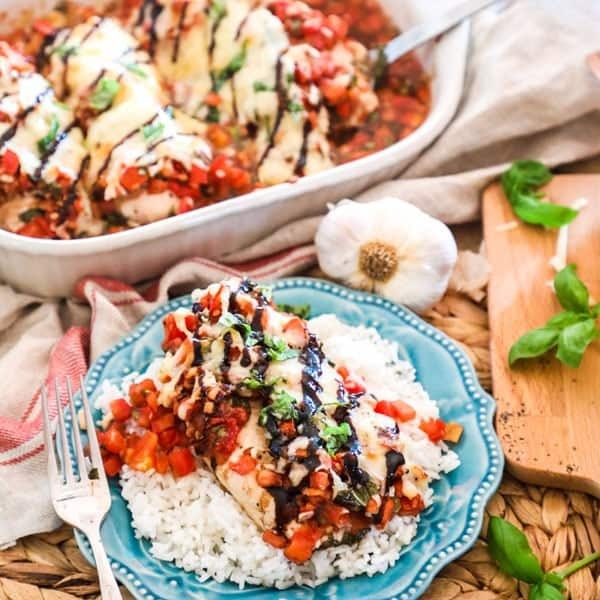 This Bruschetta Chicken is the perfect quick and wholesome Italian inspired dish for a busy weeknight. With only 8 fresh ingredients this meal comes together quickly and can be prepped and in the oven in as little as 15 minutes. 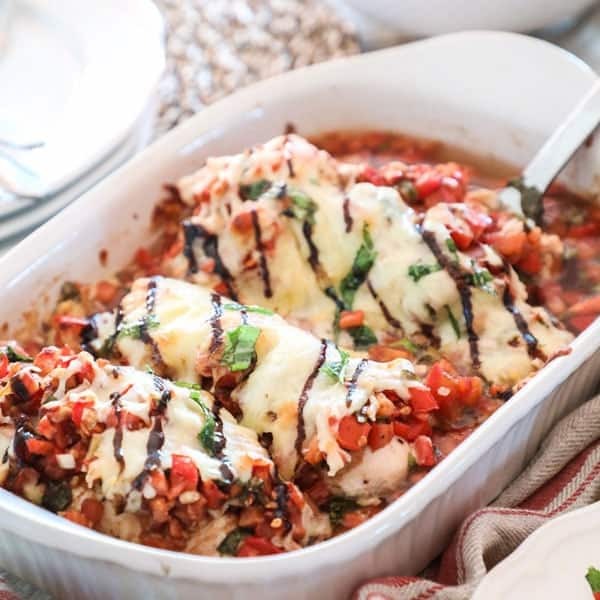 If you love bruschetta, then you will love layering the flavors on top of tender chicken to turn it into a delicious, one dish meal. If you are like me, and need a regular rotation of recipe inspiration, then the VERY best thing you can do is sign up for my e-mails (for FREE!) to get a note in your inbox on what new recipes I have cooked up lately and maybe a side of every day life. Click HERE to sign up, or on the button below. My mother-in-law always thinks it is so funny that my kids love tomatoes. I think it is funny that she thinks it is weird! What’s not to love about tomatoes? The are pretty, healthy, and when you get a good one they are so sweet it is almost like eating candy! I have been a tomato lover for life, so I really don’t know how I didn’t think to put together this recipe before now! Pronounced bru-sket-ta, bruschetta is an Italian dish traditionally prepared as grilled bread rubbed with garlic and served as an appetizer or antipasto. In America though, we are more familiar with it as a crusty garlic bread, toasted and topped with a tomato mixture. Generally, this mixture is made of diced tomatoes mixed with basil, olive oil, salt and pepper and then sometimes drizzled with balsamic vinegar. I have to say, as much as I love bread in all of it’s forms, as far as I am concerned, bruschetta the American way is pretty much perfection. Borrowing these flavors from the appetizer and making it into a complete dinner was meant to be. Follow along as I walk step by step through the recipe below, where I will go through all the frequently asked questions and add my extra tips. If you just want the quick version, you can scroll down to the recipe card below. 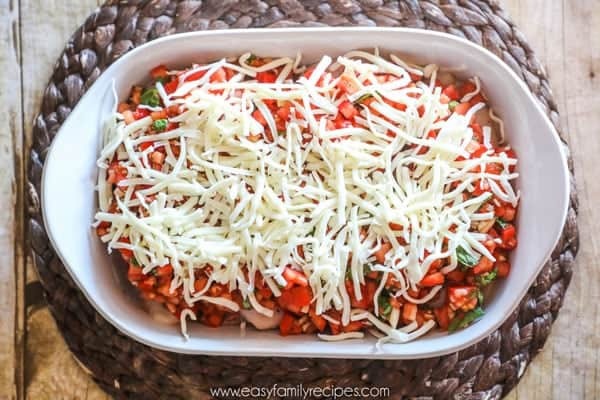 1/2 cup fresh chopped basil- Fresh basil is going to make a big difference in this dish! You can usually find it year round in the produce section, either in the refrigerar or potted near the garlic or tomatoes. 2 cloves fresh chopped garlic- Again, fresh really adds to this dish. I recommend smashing the cloves with the side of your knife and then very finely dicing them so that it can cook through and distribute the flavor throughout the dish. 4 oz shredded mozzarella cheese- This will be about 1 cup of shredded cheese. You can also use fresh mozzarella and tear it into pieces on top. Balsamic Glaze- Although it says optional, I would HIGHLY recommend this! It is super delicious and really makes this dish special. This works especially well if you have kiddos because it is nice and sweet and kids really like it! Chop the roma tomatoes into small 1/4″ pieces. This will be pretty small pieces, but it shouldn’t be too hard if you have nice firm tomatoes. I usually chop the top off then turn it to stand on the end and cut vertically in both directions almost to the base, as if you are making a grid. Then, turn it to the side and cut down the tomato, This method helps chop the tomatoes pretty quickly.Chop basil and garlic. In a large bowl, toss the tomatoes, basil, and garlic with the vinegar and half of the salt and pepper. 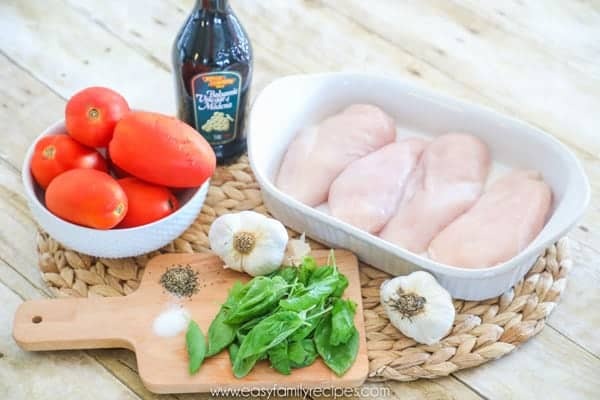 Bruschetta usually uses olive oil as well, but since there is some fat in the chicken already, I leave it out and the taste is just as delicious and a few calories are saved. 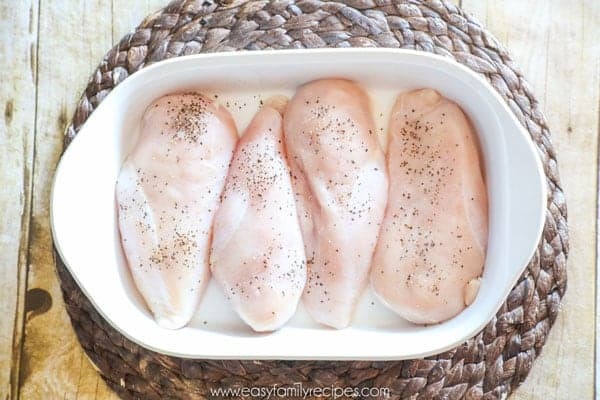 Lay the chicken breasts flat in the bottom of a large baking dish and season with the remaining salt and pepper. You can use more or less to taste as you want. Pour the tomato mixture over the top of the chicken and then use a spatula to spread it evenly over the chicken. Spreading it evenly will help it to cook evenly as well. Top with the mozzarella cheese. Bake on the middle oven rack for 35-45 minutes or until the chicken reaches an internal temperature of 165˚F. You will definitely want to cook this uncovered. Since tomatoes have so much water content it helps some of it to burn off while cooking so that it isn’t overly juicy, although there will still be a good bit of flavorful juice in the bottom after cooking. Garnish with fresh basil and balsamic glaze. Serve hot and Enjoy! This recipe is full of fresh flavors and simple to make. 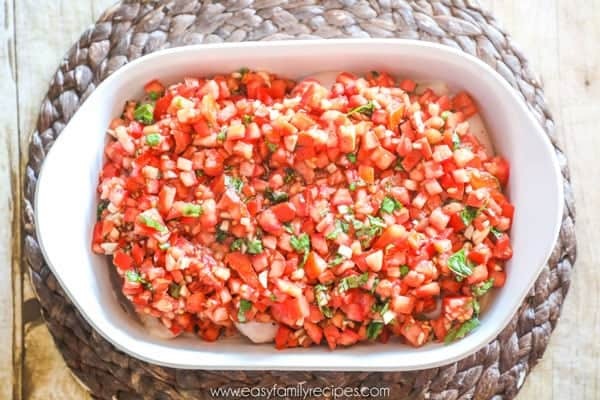 Although I do not recommend freezing this before cooking, you can save time by prepping the tomato mixture the night before or buying pre-diced tomatoes which are available in many grocery stores in the refrigerated produce section. This dish is awesome because it is so easy but still kinda fancy and impressive! You can whip this up just as easily for a family dinner as you can if you have company coming over and need something that is just a little more impressive than the usual fare. This dish can be served in a variety of traditional or low carb ways. For almost all of them, I like to top with the chicken then spoon some of the juices over everything to incorporate more of the flavors. Really the sky is the limit! Let me know in the comments if you have another way you like to serve this that isn’t listed here so that I can make sure to give it a try! Thanks so much for stopping by today. I always love to hear when you try my recipes. Snap a pic and tag me on Instagram @easyfamilyrecipes or just leave me a note in the comments and let me know what you thought! I read each and every one and knowing that others are enjoying the food and spending time in the kitchen seriously warms my heart and keeps me blogging new recipes! And don’t forget! 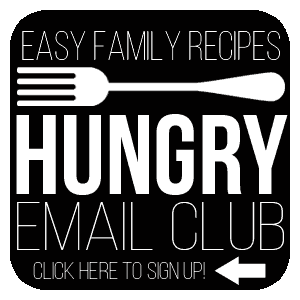 If you haven’t signed up for my Hungry Email Club, please do! I would love to share my weekly recipe inspiration with you! Sign up here or click the button below! 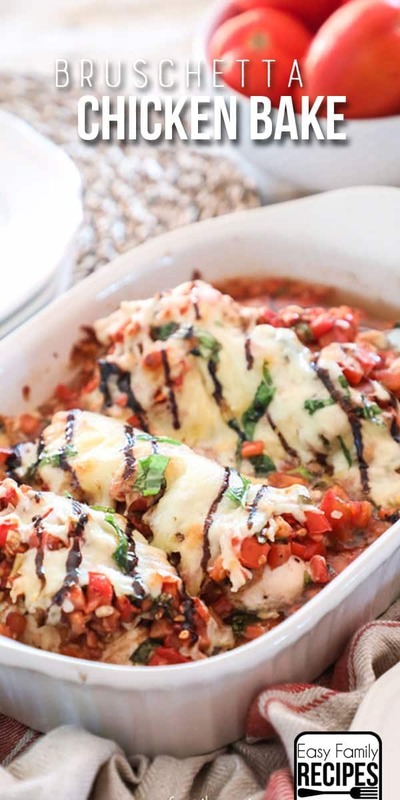 This Bruschetta Chicken will knock your socks off with its fresh bold flavors. 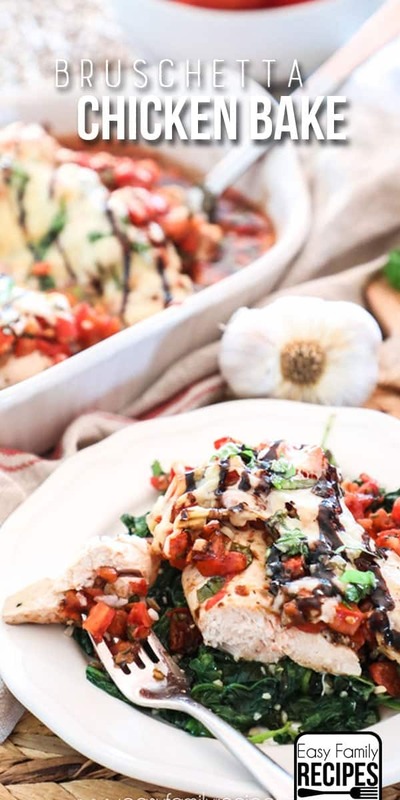 It turns the delicious taste of the family favorite Bruschetta appetizer into a wholesome meal that comes together quickly and is a crowd favorite. Chop the roma tomatoes into small 1/4" pieces. Chop basil and garlic. 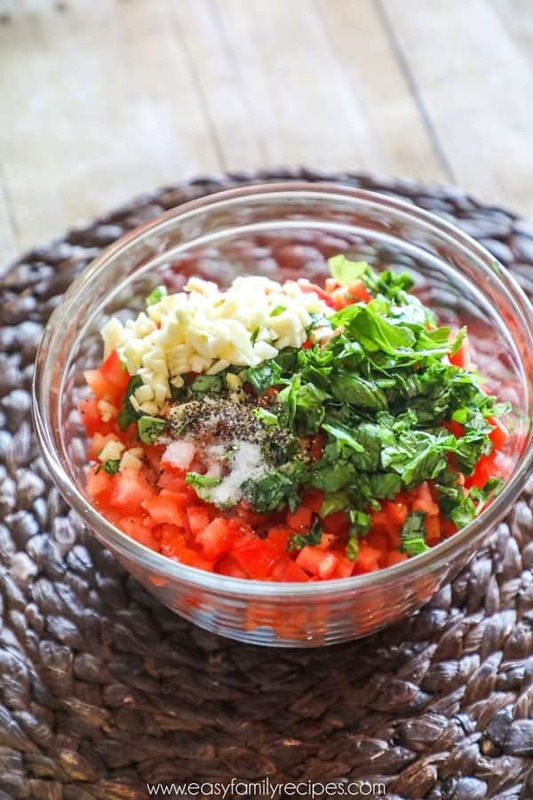 In a large bowl, toss the tomatoes, basil, and garlic with the vinegar and half of the salt and pepper. Lay the chicken breasts flat in the bottom of a large baking dish and season with the remaining salt and pepper. Pour the tomato mixture over the top of the chicken and then use a spatula to spread it evenly over the chicken. Top with the mozzarella cheese. Bake on the middle oven rack for 35-45 minutes or until the chicken reaches an internal temperature of 165˚F. 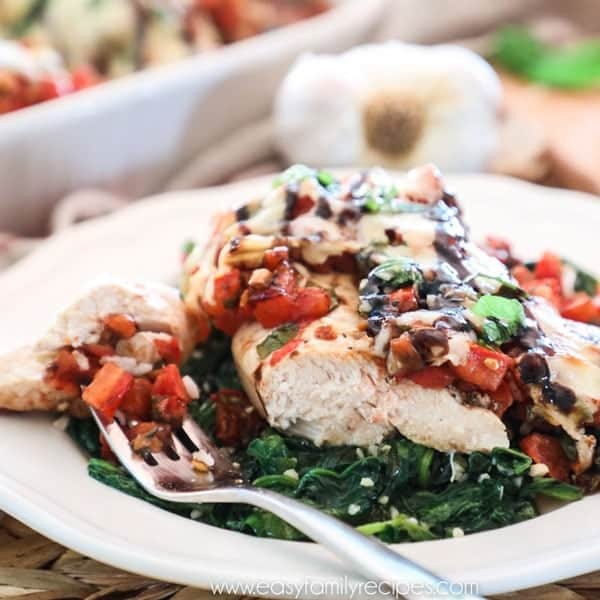 Top with fresh chopped basil and balsamic glaze to garnish. Serve hot and Enjoy! Leftovers can be stored in an airtight container in the refrigerator for up to 3 days or frozen for up to 3 months. 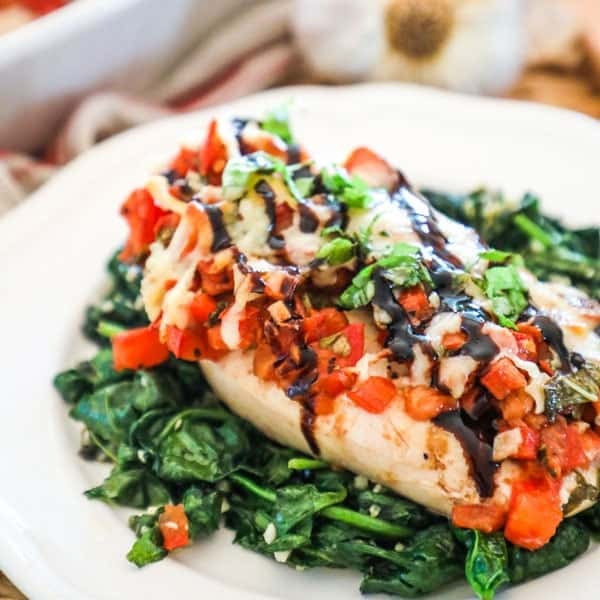 Whole30- This recipe can be made Whole30 by omitting the cheese and balsamic glaze. Didn’t see the recipe for the glaze. I buy the glaze at the store. You can usually find it near the balsamic vinegar but it is a smaller bottle and called balsamic glaze. Hope that helps! I love the layout of your posts! It really helps that you show different serving suggestions (or what type of side dish would go with the meal on some of your other posts) – it really helps a girl out! I can’t wait to try this one and many more of your recipes! Thanks for the inspiration! One of our favorite recipes! Definitely recommend using extra tomato’s because your going to want more! So delicious and easy to make!! I made this for dinner today and it was delicious! It’s definitely a keeper. I just recently discovered your blog and this is the first recipe of yours I’ve made. I am so excited to try more of your recipes. Made it! Loved it! Easy prep, I made the glaze and it added that little extra zing. We made toasted garlic toasts, like you would for standard bruschetta, then placed the cooked chicken, some tomatoes with juices and served with salad. Surprisingly not to heavy. Will definitely make this again! I put this in the WW calculator and it calculates 6 points. I’m confused as to where you came up with 2 points? Thin cut chicken breasts will work really well in this dish. They cook more quickly than standard sized so I might start checking for doneness about 5 minutes before the end of the cook time and go from there.